The pea aphid is light green with unusually long legs and cornicles (tail pipe-like projections). It is the primary aphid that attacks peas, fava beans and lentils. This aphid overwinters as an egg on alfalfa, vetch, and clover and moves to peas in the spring. Live females nymphs are produced throughout most of the year. Females take 12 days to mature and produce up to 150 nymphs. There are between 13-20 generations per year. Populations tend to be lower after cold, snowless winters or springs with persistent wet weather. Infestations during the bloom and early pod stages will reduce yield and crop quality by removing plant sap, impairing pod appearance, reducing seed fill, impairing nitrogen fixation and by the presence of aphid honey-dew. Varieties differ in their susceptibility to pea aphid damage so choose those that are less prone to high infestations and damage. Start monitoring when plants begin to flower. Action threshold include, 1-2 aphids per leaf, 2-3 aphids per stem tip or 9-13 per sweep, if a sweep net is being used. Harvest or spray nearby alfalfa, vetch or clover before winged adults are formed in the spring. There are many natural enemies (lady beetles, lacewings, flower fly larvae, predatory midges, Braconid wasps) that help reduce aphid numbers. 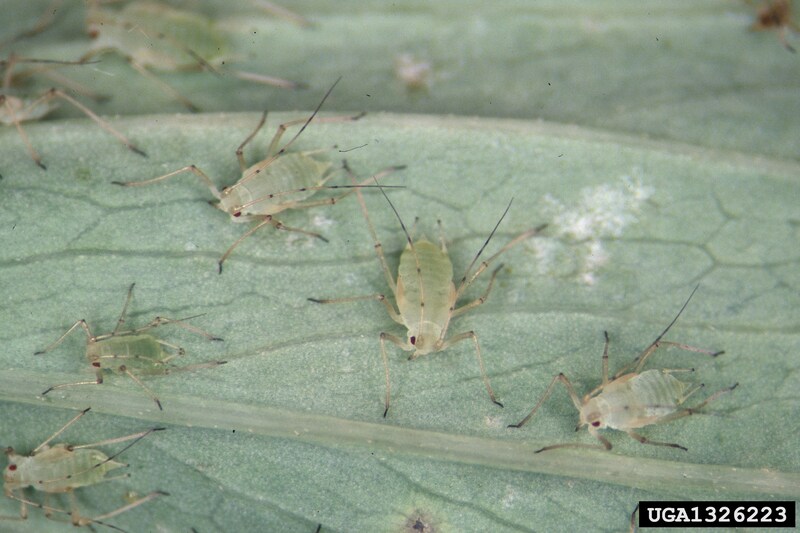 Fungi will control high aphid populations during warm, humid or wet weather. A single systemic insecticide application will control this pest.